So if you read our past three product reviews I can only assume that you are now thoroughly enjoying your fully winter-ized bicycle complete with rugged tires, grippy pedals, and some locally-made water-proof panniers. Well, now that your bike is set, what about you? As a content winter cyclist or maybe as someone who struggles to be, I’m sure you have found that a warm pair of gloves and good jacket are an absolute must. Well, consider adding one more cozy item to that list—Mammoth Muffs by T. Rex Arms! Mammoth Muffs are ear flaps that attach to your helmet straps and they are made by Roquel Horak, a hyper-local seamstress and proprietor of T. Rex Arms. If you have never used ear flaps before you should definitely give them a try. Wearing a hat or traditional ear muff under your helmet can often feel bulky and uncomfortable and can also be unsafe. 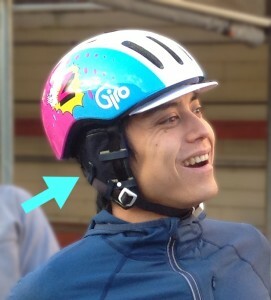 Helmet ear flaps, on the other hand, do not affect the fit or position of your helmet. As a bonus, because they attach directly to the helmet straps, there is nothing to lose so long as you keep track of your helmet, allowing you to focus on finding your gloves/bike lock/lunch pail as you try to rush off to work. Though you may not have heard of these ingenious ear cozies, there are a few options out there for you. However, I can tell you that Roquel’s Mammoth Muffs are by far the best helmet muffs I have used. Other integrated ear flaps need to be adjusted when you slip your helmet on or they fail to cover your entire ear. But Mammoth Muffs are easy to install, remain securely in place, and require only occasional re-adjustment. Mammoth Muffs are usually lined with Pendleton Wool, giving you the sensation that a cuddly bear cub has wrapped his gentle arms around your head. Polar fleece models are available for those with wool sensitivities. Additionally, Mammoth Muffs are not only made locally (indeed, only a hearty stones throw from the Community Cycling Center) but they are also constructed from recycled materials. Last but not least, at a mere $20, these muffs are considerably cheaper than ones produced by much larger operations. Come by the Community Cycling Center before the next cold snap to check out these wonderfully bike-geeky creations, and bring your helmet, too. Mammoth Muffs come in a near infinite variety of colors and patterns, so you will surely want to color coordinate! Photos by David Kurushima (and starring David Kurushima).